DL&W photo by Abby Songin. The Land Conservancy is asking nature lovers, trail users and people excited about the revitalization of Buffalo’s waterfront and communities to attend an open house to vote on the top designs in the DL&W Corridor Design Ideas Competition on Wednesday, April 10, at the M&T Center at Fountain Plaza in downtown Buffalo. The open house will run from 6 to 8 p.m. with a short presentation at 7 p.m.
687-1225) is recommended to speed up the check-in process. The Land Conservancy continues to work with a local project committee and residents of the three neighborhoods adjacent to the corridor to get their input. 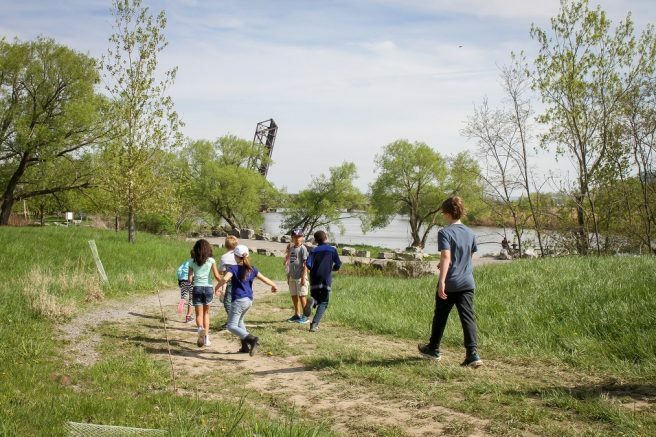 “The community continues to play a central role in guiding the transformation of this abandoned corridor into an inspiring urban nature trail and greenway,” said Nancy Smith, Land Conservancy executive director. Nearly 100 proposals were submitted to the design ideas competition from individuals and teams across the region, the country and around the world. A project committee of community representatives and over 2,100 people who voted online narrowed the field to the proposals that will be displayed at the open house. Separate from the Community Choice Award, a jury of community leaders and international experts in design, community engagement and infrastructure reuse will choose three top proposals for additional monetary prizes. Winners of all four awards will be announced later this spring. The competition will not select a final design for building the project. Instead, the competition will build on the community vision plan to generate ideas and conversations about possibilities for a nature trail and greenway on the corridor. The project will connect people to nature and each other, and help ensure waterfront communities benefit from the continued revitalization of downtown and the waterfront. The Land Conservancy will work with the community and other project partners to develop a preferred design for the project over the next year. The Design Ideas Competition is made possible through generous support from M&T Bank, BlueCross BlueShield of Western New York Blue Fund, the Ralph C. Wilson, Jr. Legacy Funds at the Community Foundation for Greater Buffalo, New York State Department of Environmental Conservation and the Land Trust Alliance, Rails-to-Trails Conservancy through the Doppelt Family Trail Development Fund, and numerous individual Land Conservancy members and donors. The total funding raised for the project to date is close to $1 million, including the recently announced $369,000 grant from the New York State Office of Parks, Recreation and Historic Preservation that will fund the next phase, which is for the next level of concept and schematic design. The Land Conservancy is also working to develop a new name and identity for the project based on almost two years of feedback and input received throughout the community vision and design ideas processes, and is about to kick off a calendar of community events with partners who will lead outdoor programs for residents living near the corridor. If you are interested in learning more about this project or the Western New York Land Conservancy, please visit wnylc.org/dlw. You can also reach out to the Land Conservancy at (716) 687-1225 or info@wnylc.org. You can support the Land Conservancy’s work by making an online donation at wnylc.org or by sending a check to P.O. Box 471, East Aurora, N.Y. 14052. The Western New York Land Conservancy is a regional, not-for-profit land trust that permanently protects land with significant conservation value in Western New York for current and future generations. The Land Conservancy envisions a future in which open spaces, working lands, wildlife habitat, and scenic beauty are cherished and protected as part of the landscape and character of Western New York. The Land Conservancy is accredited by the Land Trust Accreditation Commission and is one of 1,000+ land trusts nationwide, including 90 in New York State. Land trusts have protected 56 million acres of land. For more information on upcoming events, volunteer opportunities, or the mission of the Land Conservancy, please call (716) 687-1225 or visit wnylc.org. Be the first to comment on "Community invited to vote at open house for DL&W Corridor Design Ideas Competition"